We have recently started a series of blog posts explaining how to start large motors and why motor management is essential. In this post you will discover a practical example on the importance of correct choice of motor starting solution for the overall optimization of electrical generation. Among those, fuel consumption is one of the major factors of improvement, but also one of the most constraining. It needs to be integrated in the very early stages of the design. In most cases, it means doing the same while consuming less. Generator sizing optimization has the most significant impact on the fuel consumption reduction in a ship. Additional benefits are the weight, footprint, and size reduction. The motor starting analyses require the generators and their regulators to be considered as well as the motors with their starters and the other essential loads. Due to the complexity of such system, it was important to develop rigorous models, allowing transient and stability analyses in the most consistent, accurate, and reliable way. 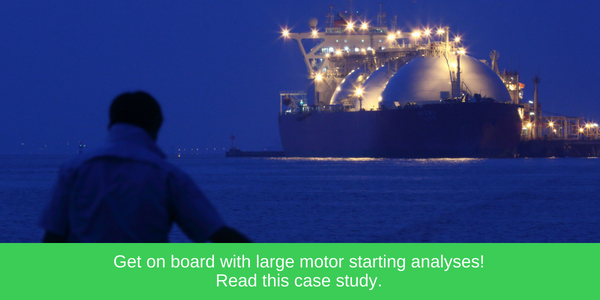 The expertise in motor and starter modeling made it possible to verify and recommend the right solutions for the starting of the large motors on the ship. In summary, the results showed that progressively with the motor power, the solutions for starting also get more complex. That is, for the lower range motors, a direct online or soft-starter solution will be sufficient. For the middle range motors, above 1000 kW, the soft-starter becomes mandatory. For the largest motor on the ship, the starting requires the use of a variable speed drive. The proposed solutions for these two LNG ships include a main switchboard and sequential motor starter. The variable speed drives were provided through a partnership with a selected manufacturer. Learn more about this adventure by downloading this case study.